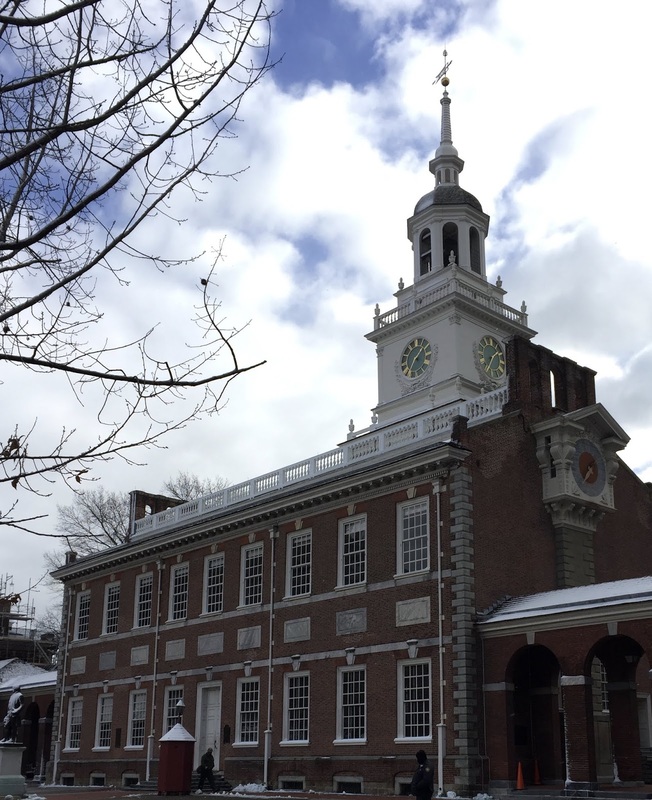 We continued along Independence Mall to include brief stops in the National Constitution Center and Independence Visitor Center, before finally arriving at the United States Mint. My father has been obsessed with coins for decades (he's quite the "numismatist"), so he implored me to take a tour of the Mint and I'm glad I did. It was a fun way to kill some time - and get out of the cold - and I'd certainly recommend it to anyone looking for a unique tourist attraction. All of that walking around had left us quite famished, so we made our way to the popular Reading Terminal Market for a late lunch (or early dinner) and then wrapped up the afternoon by walking around to see as much of the Center City area as we could before the sun went down. 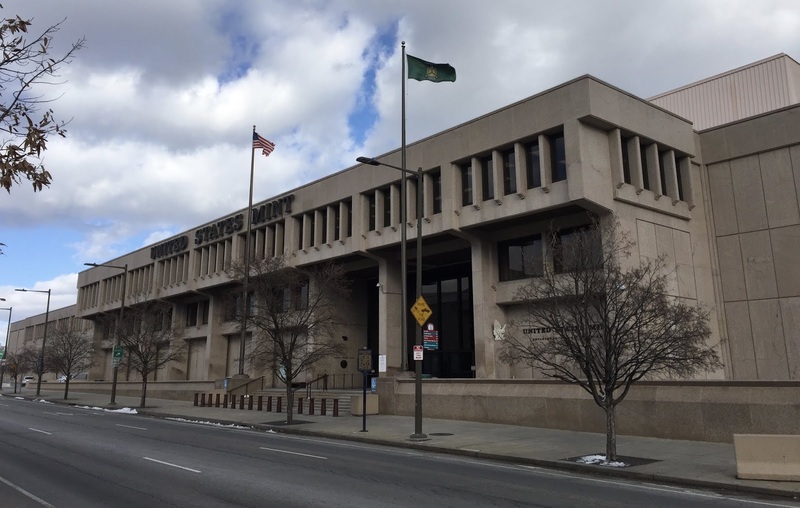 We would catch the subway from here to go to the South Philadelphia Sports Complex for tonight's NHL action. Coming in from the subway stop, we briskly walked through the massive parking lot toward Wells Fargo Center, home of the Philadelphia Flyers. 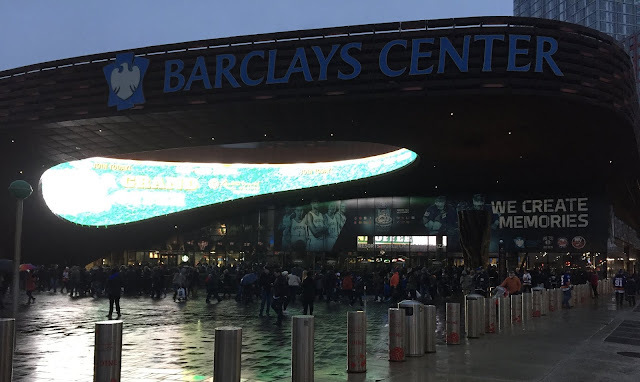 While I normally take my time to walk around the outside of every arena that I see, tonight was not one of those nights: Charlene was shivering and the building was somewhat nondescript, so we didn't spent too much time surveying the complex from the outside. 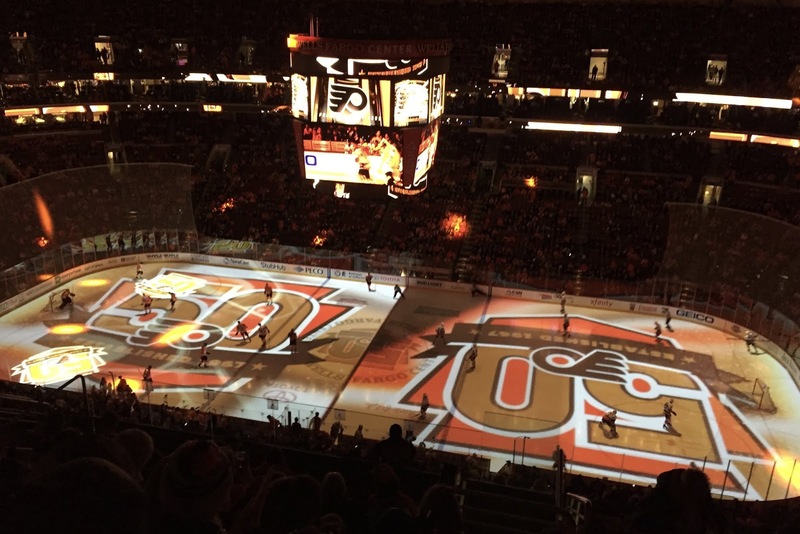 The Flyers were celebrating their 50th season in the NHL, so their anniversary logo was prominently displayed throughout the arena. 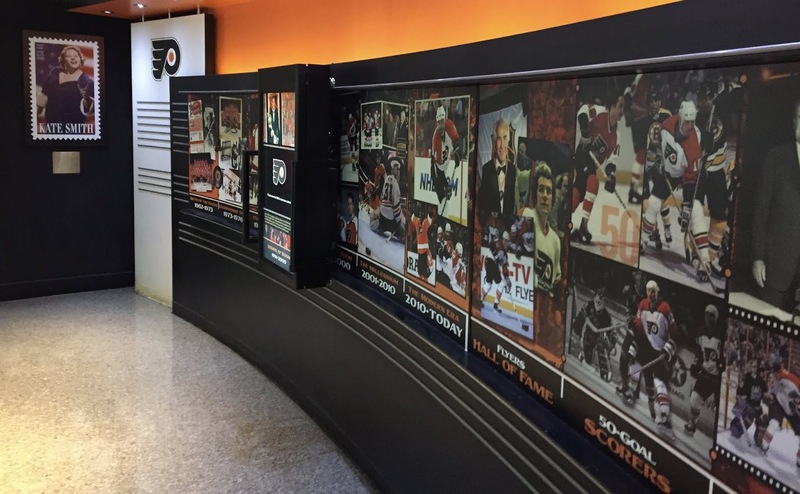 There were also some really cool artifacts honoring the team's history along the concourse, which provided a nice backstory while we waited for the opening face-off. The Flyers were struggling through a mediocre stretch that had seen them close to falling out of contention as they pushed for the playoffs - a 10-game winning streak earlier in the season was long since forgotten, and the visiting New York Islanders had surpassed them in the standings with some improved play of their own. I'd often heard that Philadelphia was a tough crowd, with the Flyers fans known for voicing their displeasure at a moment's notice - and this game would live up to that reputation. I can appreciate the passion, but it did make for an uncomfortable atmosphere at times, especially with so many Islanders fans making the trip down from New York to face scorn from the locals. The Flyers did jump out to an impressive start, with Wayne Simmonds putting the home team on the board midway through the first period - but that would prove to be the only highlight for the Flyers faithful. 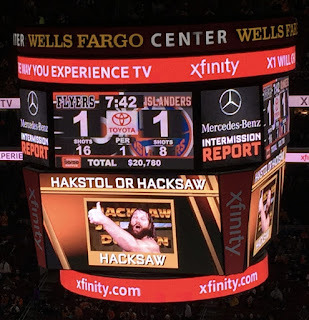 True to form, the crowd began to relentlessly boo the team once New York's Anders Lee tied the game later in the period, and some people began heckling Flyers goalie Steve Mason instantaneously after the puck went past him. The final forty minutes provided little drama, as the Islanders played a very steady game and added goals in each period to skate off the ice with a solid 3-1 victory. As I had feared, the home fans mercilessly showered the Flyers with jeers as they hung their heads and sulked back to the locker room after the final horn. We got an early start to the day and walked directly to the Edgar Allan Poe National Historic Site, the only existing house where the famed writer lived during his time in Philadelphia. It's rather small and quaint - very befitting for Poe - but does provide a lot of insight into the work of one of America's greatest authors. The museum is only open Friday-Sunday, but admission is free and I'd recommend it to anyone visiting the city on a weekend. 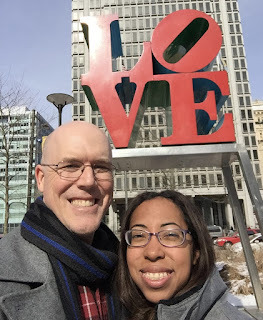 From there, we went back to the Reading Terminal Market for lunch, where we were finally able to get some Philly cheesesteaks (courtesy of Spataro's). 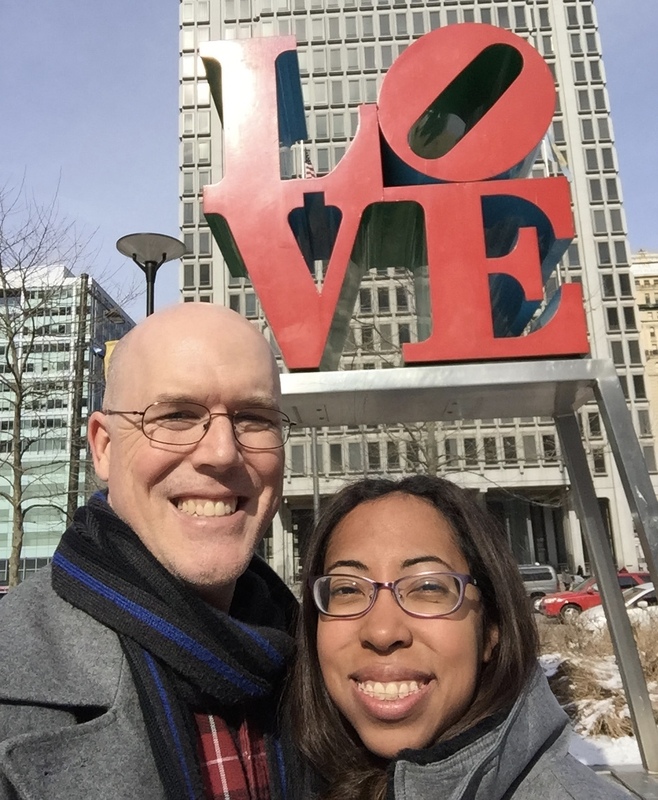 A return trip to Center City for more sightseeing came next, which included the obvious photo op at the LOVE sculpture. We were running out of daylight, so we quickly made our way to the Philadelphia Museum of Art. 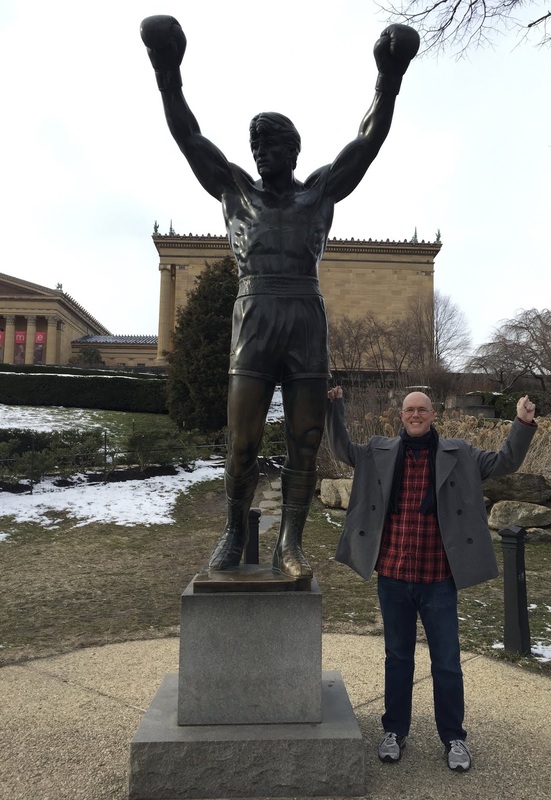 Pop culture enthusiasts like us will immediately recognize the museum from its famous steps that Rocky Balboa ran up during the ROCKY films - I had to make sure I got a picture with the recognizable statue just outside the entrance. We then crossed the Schuylkill River and arrived at the University of Pennsylvania just as the sun was setting. I have always enjoyed walking around college campuses, and this particular institution is home to a storied arena: the Palestra - dubbed "The Cathedral of College Basketball - which was celebrating its 90th anniversary in 2017. 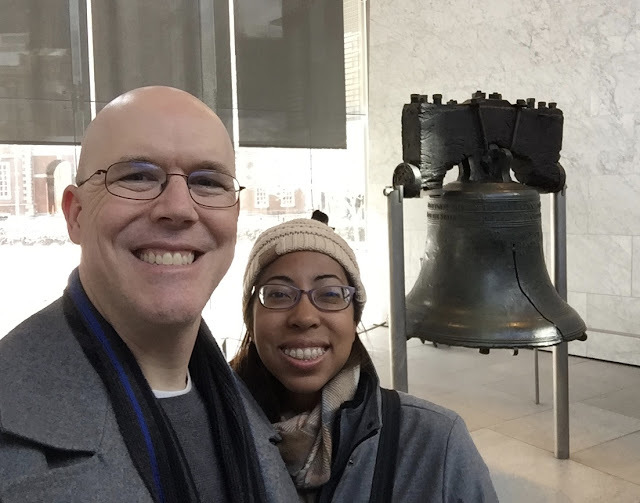 We timed our visit to coincide with a men's basketball game featuring the Penn Quakers against their Ivy League rivals from Columbia University. The game was ho-hum, but I did spend much of my time walking around the legendary building, soaking in the history on display throughout the concourse as well as in the arena's museum. My sweet tooth kicked in after the game, so our final stop of the night was for some delectable ice cream at Scoop DeVille (it's never too cold for ice cream!). There's so much to see in a city like Philadelphia, and we only scratched the surface, but it was a great time all around. 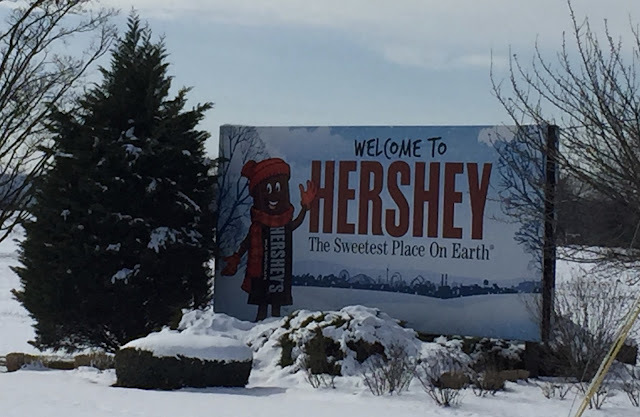 We rented a car and made the two-hour drive to Hershey on this morning, leisurely coasting along the snow-covered scenery and arriving just before Noon. Our time in the "Chocolate Capital of the World" began where any visit to this town should begin: Hershey's Chocolate World! 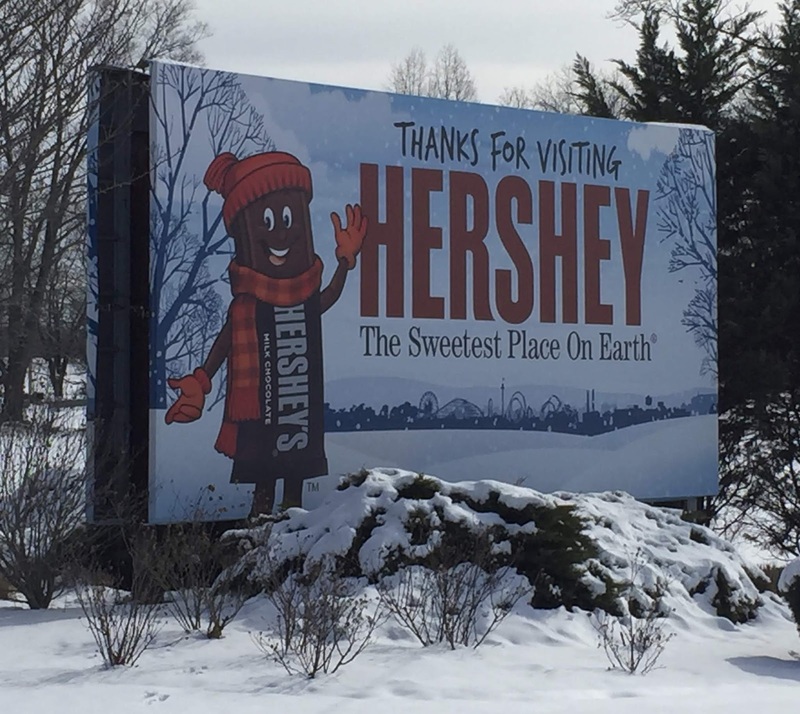 Not unlike a theme park, Chocolate World featured plenty of things to do - we started with a 90-minute trolley tour of the entire city, which detailed the life of Milton Hershey and all of his philanthropic efforts, and followed that up with a chocolate-making tour describing how the cocoa beans are harvested and turned into sweet treats. We even took a chocolate tasting class! We then grabbed dinner at the food court inside of Chocolate World, which was the correct decision - a club sandwich on cocoa-dusted bread with chocolate-covered potato chips and a dark chocolate shake really hit the spot! From there, we went next door to the Giant Center, home of the Hershey Bears. 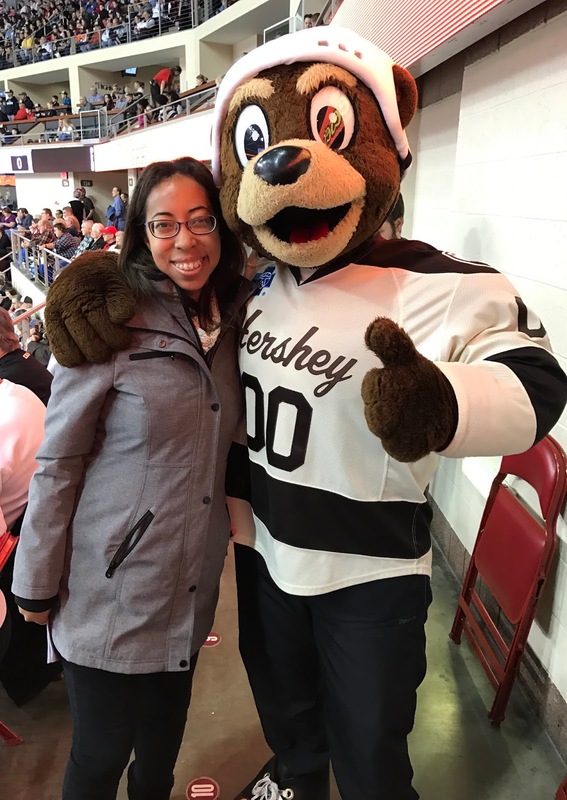 A longtime leader in AHL attendance, the Bears hosted the visiting Hartford Wolfpack in front of a sellout crowd. Unfortunately, we showed up a little late and had to leave before the game was over, but we still made the most of our time - which included meeting the Bears mascot, Coco! 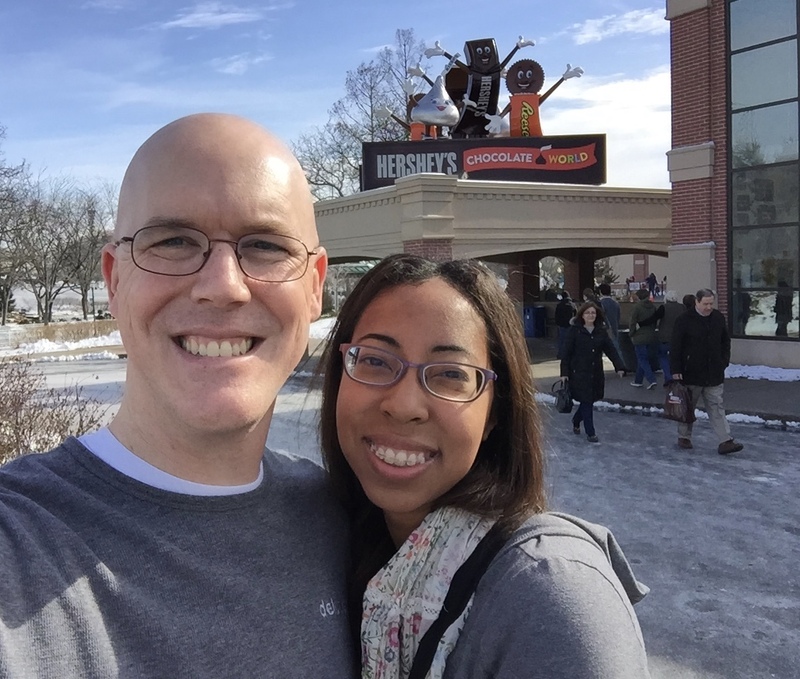 We would be staying at a hotel three hours away in Jersey City, prompting the early departure from Hershey, but it was certainly a memorable day! So what do you do when you have one day to spend in New York City? I mean, besides hockey (of course)? So truth be told, one of the reasons that Charlene wanted to come along on this trip was to take me to see a Broadway show, and I happily obliged. We chose a matinee of Aladdin, which was playing at the New Amsterdam Theatre, and the entire experience was amazing! I'm sure I'll be back for more shows in the future, but this was a wonderful introduction. It was a dreary day with heavy rain, so we kept our afternoon sightseeing to a minimum, especially since we'd both been to the city before - we mostly hung around the Disney Store and Times Square, before taking the subway to Brooklyn. It's pretty cool to be able to say that I went to a Broadway show and a hockey game on the same day, and the Barclays Center awaited us. The arena was built for basketball, and I'd heard rumors that the seating arrangement for hockey games was a little awkward, which I can now confirm to be true. The "obstructed view" nature of many of the seats was combined with sightlines that didn't necessarily prove worthwhile for hockey, making for a mediocre experience - we could see the ice completely from our seats, but the angle made it so that if someone was walking up the aisle it would obscure the action heavily. 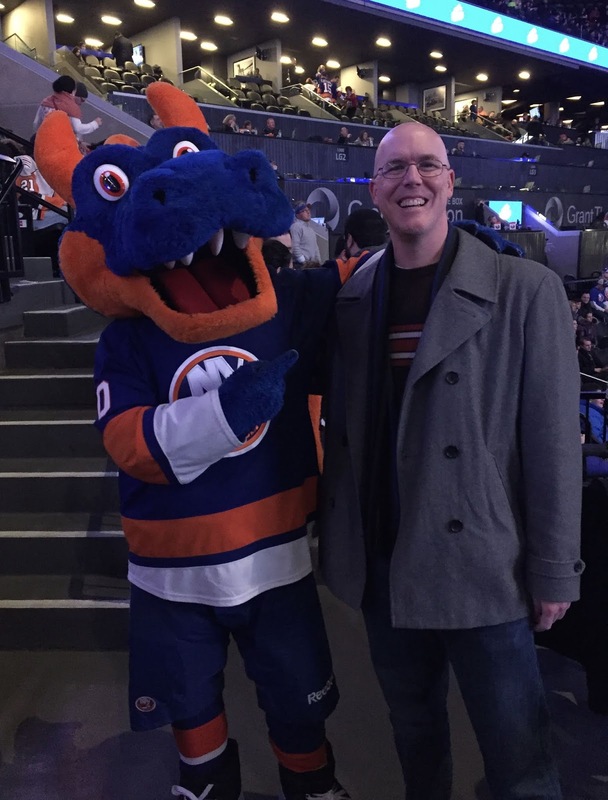 As a result, we spent almost the entire evening walking around and standing in various sections, hunting down the Islanders mascot (Sparky) along the way. The Colorado Avalanche were the visitors on this evening, and they were in the midst of the worst season of any NHL team since the 2004-05 lockout. 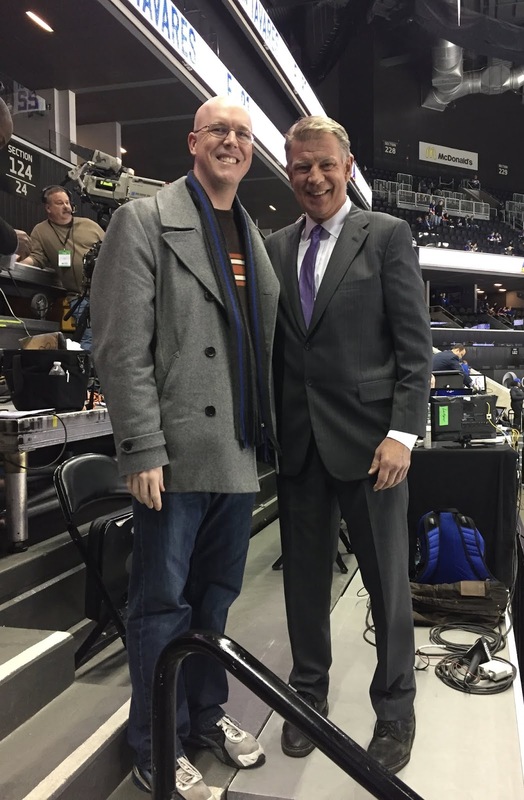 As bad as they had been, I'd always enjoyed watching their local TV broadcasts (I've had the NHL Center Ice package for several years now), and I noticed Peter McNab in the crowd. After a distinguished NHL career which saw him score more than 800 points, McNab has served as a color commentator for the Avalanche since the team moved to Denver in 1995. 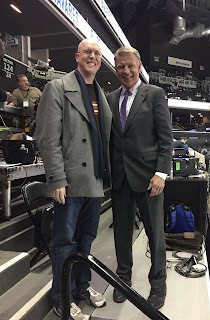 He was very affable and gracious when I approached him, and we chatted for a few minutes about the team - I regretfully asked him how the Avalanche season had been from his perspective and he could only respond, "It's been a bear!" A non-conference opponent suffering through a historically bad season. A gloomy rain-soaked day in the middle of winter. 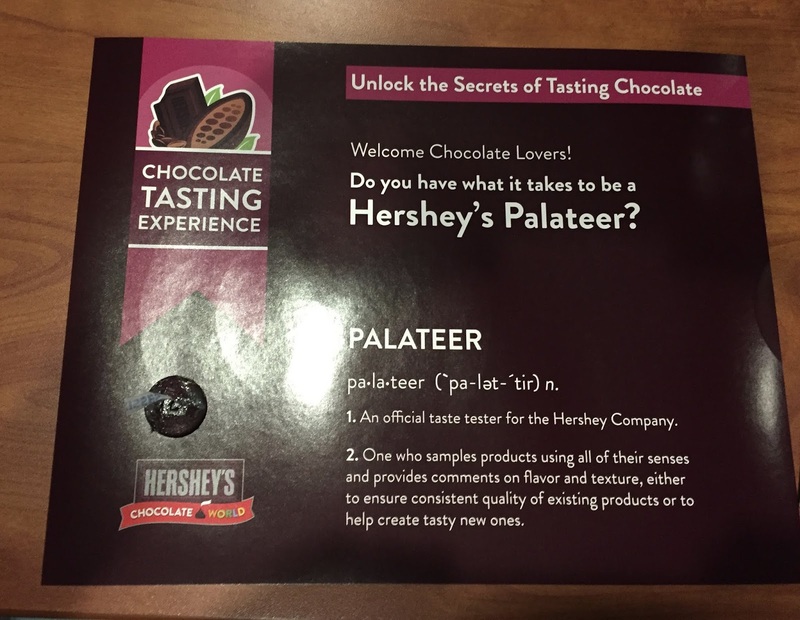 It was setting up to be a very middling experience, so I lowered my expectations significantly. After a rather boring opening period which saw the teams trade goals, Ryan Strome gave the Islanders the lead late in the second - and that's about all I can remember. 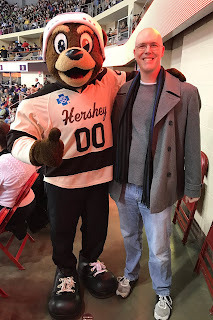 As I mentioned, we spent most of the time simply observing the new arena and tracking down the mascot, and I'm a little ashamed to admit this...but we left during the second intermission. Having been to Nassau Coliseum three years earlier, this was my first "follow-up" trip to an NHL market, so I didn't feel too indebted to seeing the entire game. Plus, I had Charlene with me and this was our only night in the city - I just didn't want to stay at the game any longer when there was so much else to do. 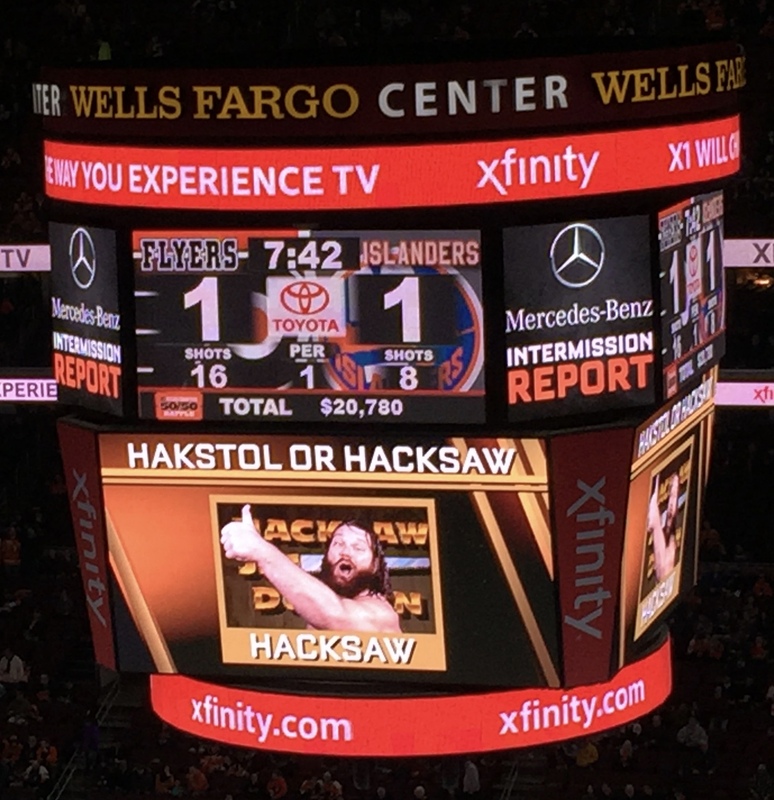 The Islanders would score three times in the third on their way to a 5-1 win, so I'm glad those in attendance got their money's worth. The rain had stopped once we got outside, so we ventured out into Brooklyn in search of dinner - ultimately winding up at Sky Ice, where we would feast on some delicious Thai food and sweet dessert. The rest of the evening was spent wandering around Manhattan before taking the train back to New Jersey to rest up for our very early flight the next morning. The trip was all too brief, but wonderful in its own way. There were no shot glasses for sale at Wells Fargo Center. There were no shot glasses for sale at Barclays Center. Suffice it to say, I was not thrilled by either development. I therefore had to run to eBay to find glasses for the Flyers and Islanders - though I was thankfully able to find one at the team store in Hershey.